ESPN reporter Laura Rutledge wouldn’t have though what happened to her on field during a college football game. While covering a contest between Georgia Bulldogs and UMass Minutemen in Athens last week, she was knocked down by Prather Hudson while attempting to evade a tackle. Even though it looked like a nasty crash, Rutledge luckily came out unscathed. “Took an L in Athens today. So many thanks to everyone at @UGAAthletics for their help after this happened…even though I’m a Gator,” Rutledge wrote on Twitter. Hudson, later, replied by asking her out on date. 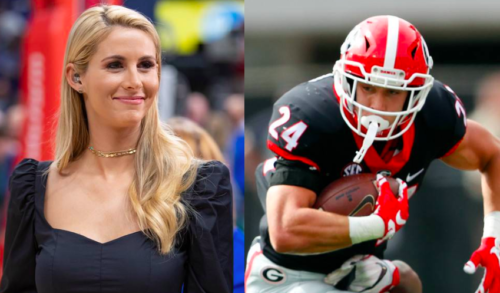 “Hey @LauraMRutledge really sorry I knocked you down,” he wrote on Twitter, “but… I can pick you up at 7,” he asked. Much to his dismay, however, she turned it down. “Actually nope but I’m married,” she wrote. Rutledge, 30, won the Miss Florida contest in 2012. She married baseball player Josh Rutledge in 2013.